On April 29, 2010, Bhutan issued a set of eight commemorative stamps on the eve of 25 Years of SAARC, the South Asian Association for Regional Cooperation. The eights stamps depict the national flags of all eight memebr countries of SAARC. 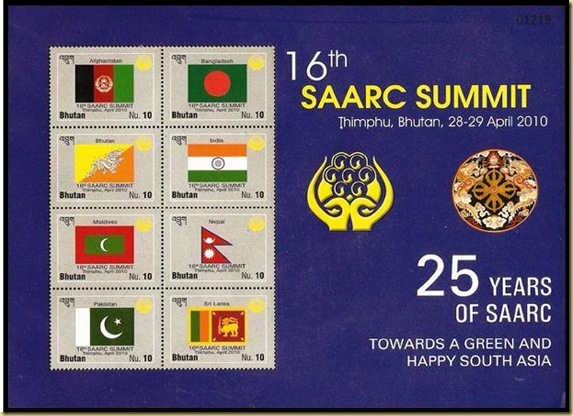 Bhutan also issued a stamp on the eve of holding the 16th summit conference at Thimpu, which coincided with the Silver Jubilee of creation of SAARC. The SAARC initially comprised seven South East Asian countries of Bangladesh, Bhutan, India, the Maldives, Nepal, Pakistan, and Sri Lanka. Afghanistan joined the organization in 2005. With its headquarteres in Kathmandu, Nepal, the organization aims at joining hands in cooperating in the fields of agriculture, education, culture, and sports; health, population, and child welfare; the environment and meteorology; rural development, tourism, transport; science and technology, and communications. Besides it eight member, Australia, China, European Union, Japan, Iran, Mauritius, Myanmar, South Korea and the USA also attend the SAARC proceedings as observers.